Quirky Jessi: You are what you eat....so wash your hands! You are what you eat....so wash your hands! I love creative advertising. Anything short of interesting and it's not even going to catch my attention, much less hold it long enough to know what the ad is trying to sell me. For these, the idea is that you "are what you eat." 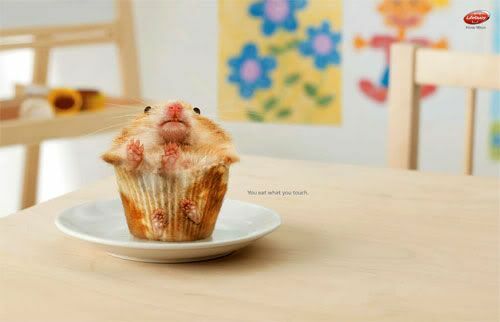 So if you touch the hamster, you're eating all those germs, too (so use Lifebuoy soap, of course! hehe). There's another fish-related picture and more talk about Lifebuoy here. Well then! Lesson effectively re-enforced. Too bad I am too horrified by to buy the soap. And oops, Kitty. I guess maybe they should've focused more on their brand name instead of scaring the crap out of people, huh?